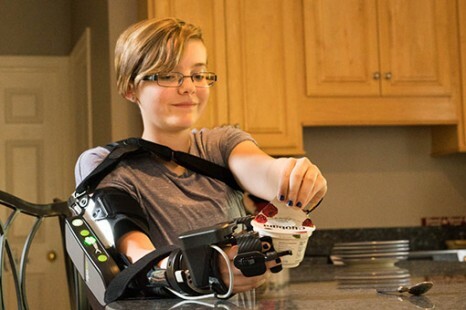 Myomo Inc announces that its MyoPro myoelectric arm orthosis is now available to adolescents to help restore upper limb functionality in paralyzed or weakened arms. In order to facilitate MyoPro fittings and delivery to adolescent patients, Myomo has partnered with Easterseals DuPage & Fox Valley (Chicago area), and is exploring partnerships with additional youth institutions and children’s hospitals, according to a media release from Cambridge, Mass-based Myomo Inc.
Based on patented technology developed at MIT, MyoPro is designed to sense a patient’s own EMG signals through noninvasive sensors and restore function to the paralyzed or weakened arm. This allows MyoPro users to perform activities of daily living including feeding themselves, carrying objects, and doing household tasks. This entry was posted on June 19, 2018, 11:51 and is filed under Paretic Hand, Uncategorized. You can follow any responses to this entry through RSS 2.0. You can leave a response, or trackback from your own site.